The bergere chair was a popular form of upholstered easy chair in England and France during the early 19th century. However, only a handful of such chairs were made in America, and each American example which has been identified to date traces its origin to the American Federal period. 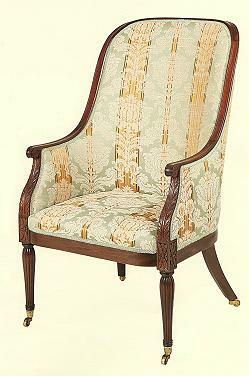 One of the most beautiful Anerican bergeres was this Sheraton style chair made in Philadelphia circa 1810. Our American Federal ClassicsTM replica of this rare chair is made of select South American mahogany, with each carved detail executed in precisely the same fashion as the original chair. The moulded exposed wood frame outlines the graceful curve of the back, terminating in rolled hand rests which continue to sloping leaf carved arm supports above a carved rectangular panel which continues to bulbous reeded front legs. The raked rear legs echo the shape of the chair back and complete a most satisfying overall design.